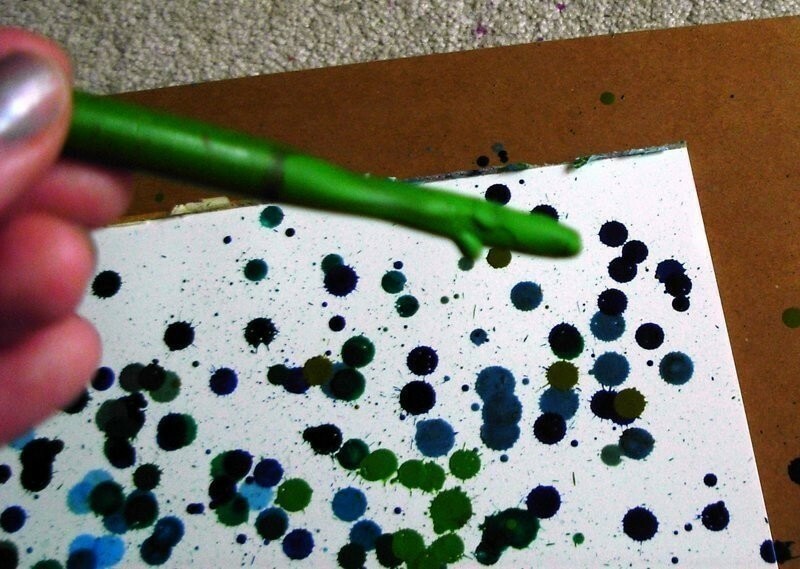 This tut is a project that has been my obsession lately-- crayon wax spatter paintings. I have a plastic Esprit box that I've had since middle school filled with these splendidly colorful little wax-and-pigment sticks. Many people look down their artsy noses with disdain after they reach 6th grade because they think that the 64 pack of Crayolas with the built in sharpener is "babyish". Well, crayons ain't just for coloring books! They can be used to make truly funky, one-of-a-kind pieces of abstract art for your walls, and you can customize them with colors that you love. And this quick 'n dirty tutorial will show you how. 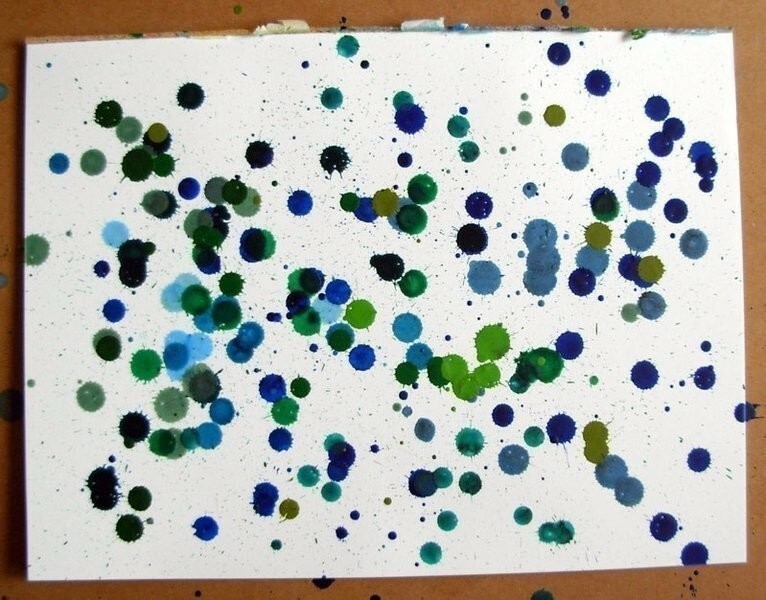 For this project, you will need an assortment of peeled, wrapper-free crayons in the colors of your choice, a few lighters, and paper or canvas of your choosing (I used white Bristol board because I like the weight of the paper and the nice whiteness shows off the bright crayon drips nicely). 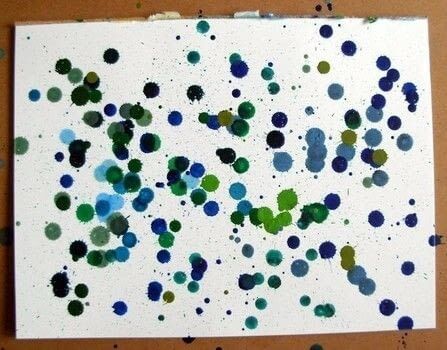 You will also need newspapers or a larger piece of scrap cardboard to place underneath the paper or canvas. This is to catch the drips and protect your floor surface. (I did this project with the Bristol board and a drip-catching cardboard placed on the floor because I found it easier than doing it on a tabletop.) I used a big piece of cardboard and did this in my art room, where the floor is a mess anyway. You may not have this luxury, so please be careful to avoid any errant drips, especially if it isn't your floor. Some drips might be scraped off after they harden, but be careful just the same. A few more words of caution: we are using an open flame from a lighter to melt the crayons. Please, please, PLEASE use the utmost care when using a lighter and when melting the wax, which gets outrageously hot. Please read the warning sticker on the side of it and take it seriously. Don't burn yourself, someone else, your house, or someone else's house down for the sake of art. Avoid doing this in the close vicinity of curtains, bedsheets, or flammable chemicals, or anything else that could possible go up in a ball of flame. This project is suitable only for those who can be responsible with using a lighter and is definitely not for children. You are ultimately responsible for your own safety, so read this whole tutorial through before attempting flick your Bic near a crayon. Assemble your crayons, lighters, and paper/canvas. Make sure your crayons are peeled from their wrappers. You will need a few lighters to get this project done, since when one gets too hot to use, you will need to switch to a new one. I got one of those multipacks of the rainbow colored ones. Let the hot lighter cool down before using it again. Be aware of where you are holding the lighter and the crayon. After you have found a suitable place to do this project, hold the crayon at a downward angle over your paper or canvas. If it has one, try sliding the flame switch onto the "low" end before trying to do this with the high flame. 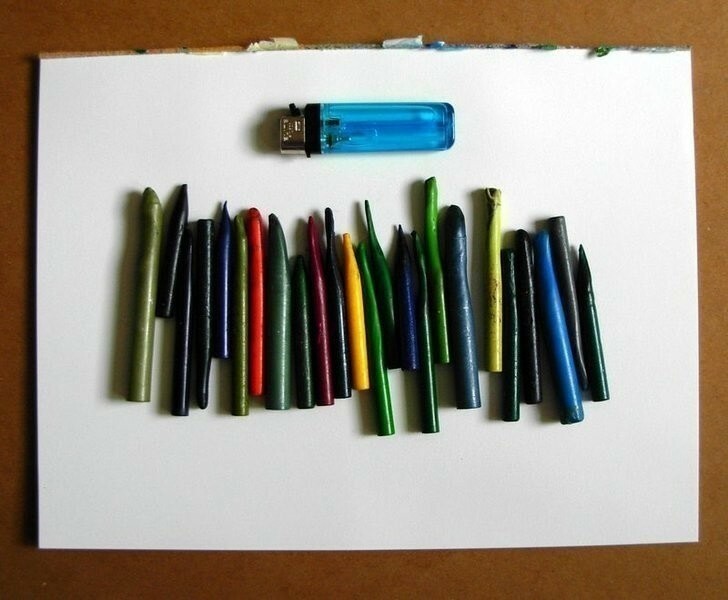 Carefully flick the lighter and hold it to the tip of the crayon. The wax will quickly melt, so be aware of where you are aiming your drips. Repeat for the other colors. Again, remember you will have to switch up your lighters to let one cool down before using it again. Aim the drips in a random pattern over the paper/canvas and drip away until you have the results you want. The beauty of this is that no two paintings will ever come out alike and that crayons come in such a huge variety of colors. Admire your new abstract work of art! Now it is ready to be framed or given as a gift. This is really cute! & I love the idea that "Taz" wrote to put them on candles... great ideas! You know if your worried about buring your fingers you could always use a grill lighter. And if you have small colors you want to you but there a bit to small to safely melt you just stick one of the thing you stick in corn on the cob to make it a bit longer. Just some ideas. This is such a great idea, i have a ton of crayone that i can finally use, thanks for the idea! it is so fun! and the end result is great! No prob Jessie, I've been going nutty with these projects lately! It is fun and Cat yes, it does feel cool!